Planting method: Root cuttings planted 2 inches below the surface in clay soils and 4 inches in sandy soil. Use little finger-sized cuttings about 6-8 inches long. Store in plastic bags at 45° if necessary. Harvest Time: Summer as the berries mature and are full colored, sweet and release easily. Most varieties will bear fruit for about two weeks or so in late May through early June. Culture: Plant in full sun in healthy soil. Two year old canes bloom and produce fruit and then die after the fruit have matured. Prune the old canes out after harvesting because they will never produce again. Keep the plants cut to form a 3 foot high hedge. Do not do any winter pruning because the buds are formed in September. Troubles and Solutions: Double blossom (rosette), anthracnose, redneck cane borer, and a few other minor problems. The worst problem with blackberries is the aggressive spreading characteristic. Harvest Storage: Harvest the berries as they ripen and turn dark purple. Eat right away or store in the refrigerator, 32-40° for about two weeks max. Notes: Don’t allow suckers at the base of plants to spread. Varieties: Brazos is probably the best choice. Comanche, Humble, Brison, Choctaw, Navaho, Wommack and Rosborough. It’s best to avoid Gem, Lawton, Young, Barpen, Fluit, and the old thornless varieties. The best raspberry for Texas are Doman red. They should only be grown in sandy acid soils. 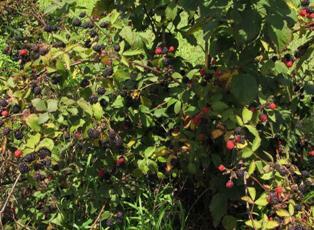 A very large early ripening blackberry, with high yields. Ripens June 3rd. In zone 7. Fruit size comparable to Apache Blk. Berry, and holds it large size through fruiting season. Yields very good comparable to Ouachita blk. Berry. Flavor and quality have been good, the plant is not as erect as other Arkansas types, and would benefit from trellis system. Fruit has held up very good in storage. No disease problems have been observed. This variety is a semi erect type plant, bears very heavy, large fruit with excellent flavor. It will be earlier ripening than the Chester and is as winter hardy as Chester, makes a very sturdy cane system. Winds do not affect this variety as bad as others; canes do not brake at base, like some types do. 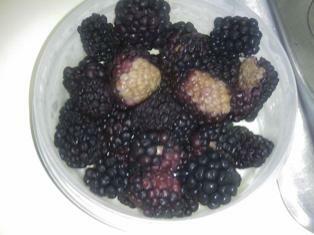 Q: Some of our blackberries have small to large portions that turn a tannish color on the vine. Any idea what may be causing this? A: A blackberry grower friend tells me this is a common problem of Apache blackberries. It is a genetic defect that is associated with a pathogen. The disease can be addressed by spraying PureGro but you may want to plant some other varieties. Ouachita is his favorite. Here’s some info on the other choices.